This is a set of 4 mid century modern dining chairs from the Broyhill Brasilia collection. 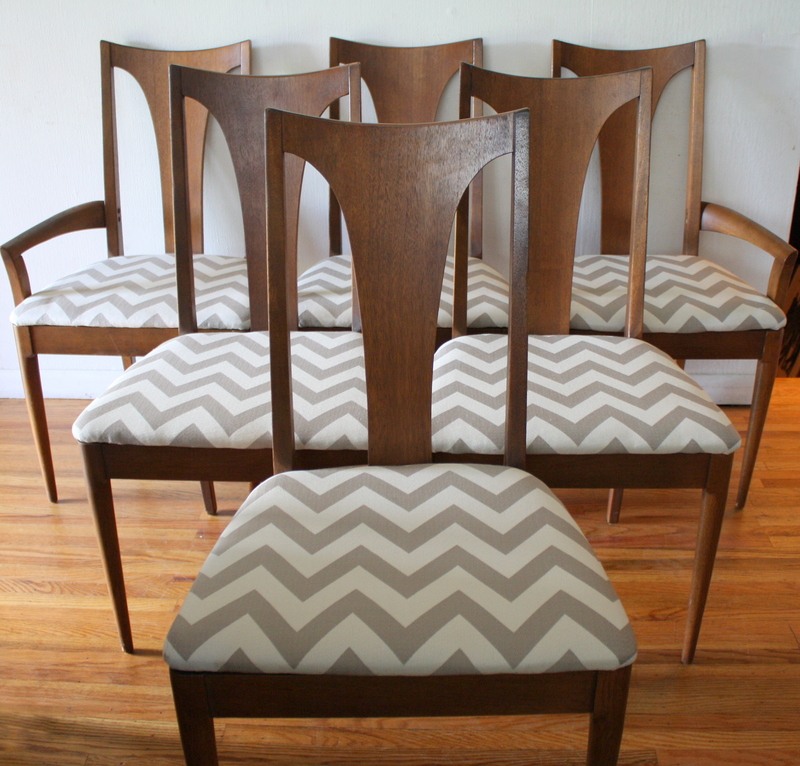 They have solid wood frames with their signature arched backs, and newly upholstered seats in aqua and eggshell chevron. Dimensions: seat width: 20″, seat depth: 18.5″, seat height: 20″, back height: 35.5″. These are 3 sets of mid century modern dining chairs. The first set of 4 are Broyhill Brasilia dining chairs with their signature sculpted backs, and newly covered in teal tweed: 19″ seat width, 15.5″ seat depth, 17.5″ seat height, 42.5″ back height. The second set of 4 chairs has solid wood tall arched frames, and newly covered in gray and white chevron: 20″ seat width, 17″ seat depth, 18″ seat height, 40″ back height. The third set of 4 chairs has solid wood curved back frames, and newly covered in black and white chevron: 16″ seat width, 16.5″ seat depth, 17″ seat height, 33″ back height. All dining sets are sold. This is a mid century modern dining chair set from the Broyhill Brasilia collection. The set has its signature arched solid walnut bases, 2 arm chairs and 4 side chairs. The seats are recovered in a gray and eggshell chevron. 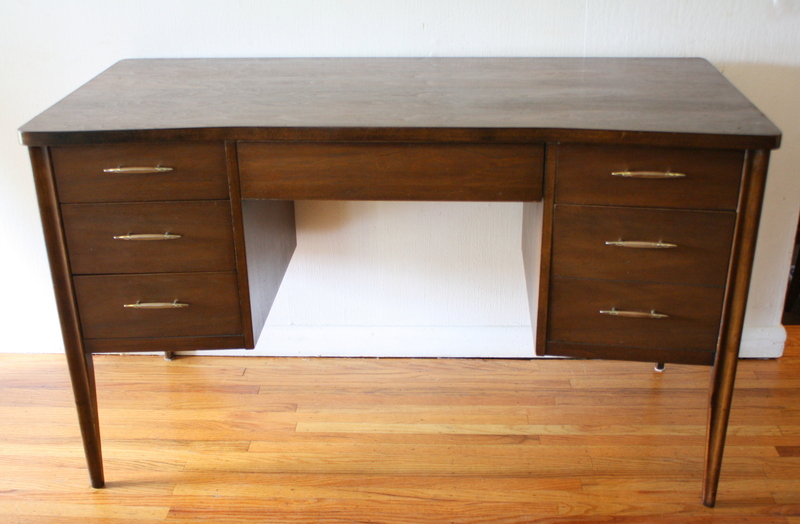 This is a mid century modern desk from the Broyhill Saga collection. It has the signature sculpted legs, and 6 dovetailed drawers with brass accented handles. The top has a beautiful angled design, and it has a finished front. Dimensions: 50.5″W x 22.5″D x 30″H.